This exhibition works towards disrupting the normalised discourse on the use of everyday objects in art. The use of everyday objects in art has been widely discussed heralding Duchamp’s first readymade as the instigator of this mode of production. What has yet to be the focus of investigation is the influence of consumerism and its effects since the 1950s, making explicit allusion to alternative ways of consuming and creating. Looking beyond the initial concerns of the readymade, existing objects are brought together, re-configured, and re-contextualised through the work of Samantha Donnelly, Mia Goyette, Hannah Regel and Russell Hill. The original independent culture of DIY present since the 1950’s and its desire to produce, transform, and reconstruct was centred on individuals who would engage with preexisting materials in order to satisfy their own needs.Companies such as Ikea and B&Q have popularised the use of the term DIY (or, Do It Yourself) to describe the practice of buying a set of components to be assembled. This fixed corporate paradigm, which might suggest an absence or hijacking of creativity, can in fact be read as an attempted shift in the way we consume. This move towards a more active way of absorbing the overabundance of consumer goods around us has inevitably infiltrated the culture of art production. The way we consume shapes the way we produce. In assembling new work from a variety of already produced materials, the artist - who is also an everyday consumer – configures new compositions that could be considered as visual collages of signifiers that define society. From this perspective, the artist is a challenger to the predetermined modes of day-to-day consumption, dislocating the trajectory of instruction manuals and prescriptive DIY guides. Samantha Donnelly was born in Manchester in 1978 and lives and works in Manchester. Solo exhibitions include 'Reception', Standpoint Gallery, London, 2012; 'Contour States' The Cornerhouse, Manchester, 2012; 'Workroom', Bloc Projects, Sheffield, 2011; 'Shoulder to Shoulder', Ceri Hand Gallery, Liverpool, 2011 and 'Compendium', Vitrine Gallery, London, 2010. Recent group exhibitions include 'Tip of the Iceberg: Art from Up North', Contemporary Art Society, London, UK, 2013; 'Jesmonite on Paper', A3 Project Space, Birmingham, UK, 2013; 'Title', The NewBridge Project, Newcastle, UK, 2013; 'Jesmonite on Paper', Malgras Naudet, Manchester, UK, 2013; 'Have You Seen Dante? ', Vitrine Gallery, London, 2012; 'No.3’, GlogauAIR, Berlin, 2012; 'A Private Affair', Harris Museum, Preston, 2012; 'The Shape We're In', Zabludowicz Collection, London, 2011; 'Fabricatecstasy', Jake Studio 52 Hoxton Square, London, 2011 and 'Perhaps Something, Perhaps Nothing', Leeds Met Gallery, Leeds, 2009. Mia Goyette, born 1989 (USA), lives and works in Berlin. 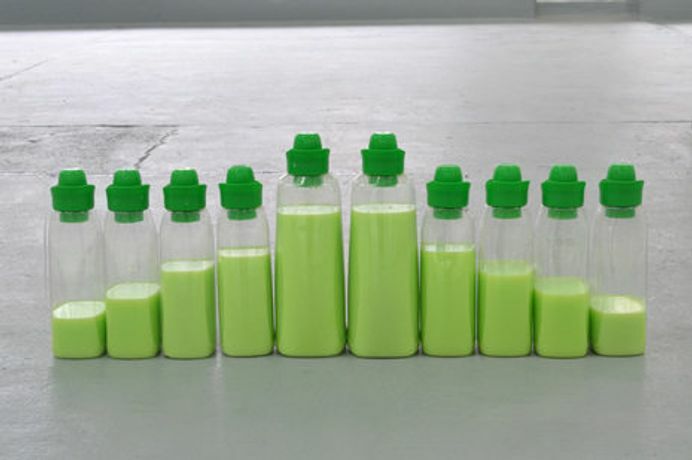 The artist’s sculptures and installations speculate on the relationship of objects to the body, mortality and youth, and the aftermath of consumer life. Her work has been exhibited internationally, including solo presentations at Vitrine Gallery (London), Frankfurt am Main (Berlin), and CEO (Malmö), and group exhibitions at Bodega (NYC), Sandy Brown (Berlin), and Greene Exhibitions (LA). Russell Hill was born in Rugby, Midlands in 1988 and lives and works in London. Solo exhibitions include, 'Marion II', Baltic Centre for Contemporary Arts, Gateshead, UK, 2014; 'Marion I', Hilary Crisp, London, UK; 2014. Selected group shows include, 'Young Gods', Charlie Smith London, London, UK, 2015; 'There was an opening. The carpet was squishy', Flat Time House, London, UK, 2015; The Manchester Contemporary, Old Grenada Studios, Manchester, UK, 2014; 'Twin Heat', Rogue Project Space, Manchester, UK, 2014; 'Poppositions', Dexia Art Centre, Brussels, BEL, 2014; 'Addendum (on the shortness of life)', Gallerie AVU, Prague, CZE,2013; 'Confined', NEST, The Hague, Holland, NLD, 2013; 'Tryouts', Down Stairs, Great Brampton House, UK, 2013; 'Rote Learning', Two Queens, CUSP, Leicester, UK, 2013; 'Likeable', Supercollider Contemporary Art Projects, Blackpool, UK, 2012; 'Expansive Mood', Mansion House, London, UK, 2011; 'Catlin Art Prize 2011', Tramshed, London, UK, 2011. Hannah Regel (b. Nottingham 1990) is an artist and writer living and working in London. Recent solo exhibitions include 'Want Me To The Marrow', Rice & Toye, London, 2015 and 'Shaking The Grey', STORE, London, 2014. She is also the co-editor in chief of the feminist journal SALT.